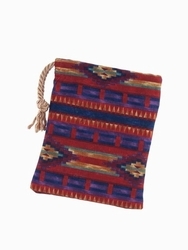 Native American cards feel right at home in this black tarot bag decorated with symbols and teepee clusters. There are thunderbirds, turtles, suns, water (rippled lines), buffalo/bison heads, sunrises, and other symbols too. 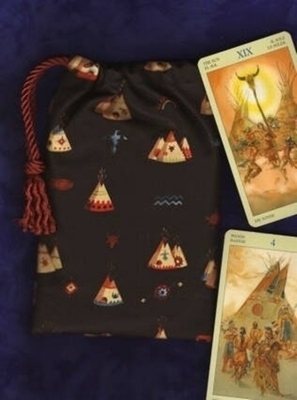 Some of the decks that correspond nicely with this bag include the Native American Tarot Deck (two cards shown in picture), Vision Quest Tarot, Tarot of the Southwest Sacred Tribes, Medicine Woman Tarot, and others. Size: Regular, approx. 4-3/4 x 7-3/4 inches, fits standard sized decks or smaller. To the Native American of the Plains, the tipi was home. It was eminently practical � warm in winter, cool in summer, rugged, portable, easy to set up�and it satisfied the owner�s aesthetic and spiritual sensibilities. The tall, slender cones filled with diffuse light provided a space for the spirit to soar. The circular plan mirrored nature: the earth, the sky, the seasons, life itself.